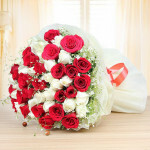 There's nothing more romantic than a bunch of long-stemmed romantic roses accented with pure gorgeous white ones. Fancy your love with a stunning bouquet of red and white roses and make them feel love like never before. Take up most of the room in their heart with a perfect expression of love and devotion and make their day imperfectly perfect.